Our research in this area has lead us to develop a system that is giving you the highest possible standards of manufacture and aesthetics. Using glass on furniture will enhance and create a stylish look creating the illusion of extra space, contact us if you are looking for a custom made feature piece, or if you have a broken or cracked piece of glass that needs replaced. Furniture made by UV-bonding glass on glass. We design custom made to your specification Specialist glass solutions using the latest and most innovative UV bonding equipment and techniques and our experience and craftsmanship of our dedicated art department we can create beautiful glass furniture. 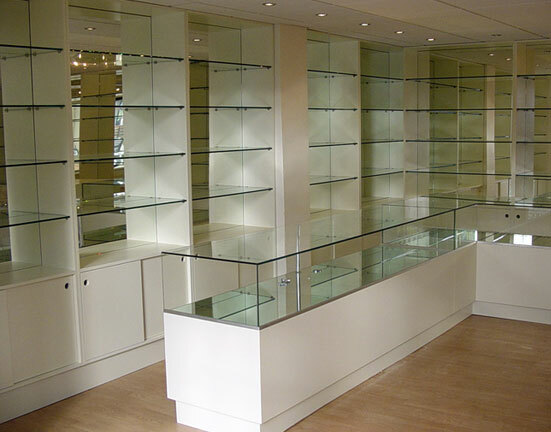 We specialist in manufacturing glass cabinets, glass shelves and glass table tops made form toughen glass UV bonded, to Metal, framing or supports. Using the best of safety toughen glass we create glass furniture designs that have the fragile appearance yet robustness for daily use. Looking for a sleek and modern product for your home? APG mix style and practicality, when we use strong, effective UV-bonding techniques that enable us to take a glass and turn it into a stylish statement piece of furniture ideal for your home or corporate environment. We can bond glass from 6mm to 25mm using standard float glass or low iron glass as well as being able to bond other materials to the glass. With a team of people that are highly skilled and have years of experience working with glass we can produce the finest results seen in the Irish glass industry to date. UV Bonding is the process of bonding 2 pieces of glass using an adhesive that is cured by UV light. The finished bond is crystal clear or highly transparent and depending on the type of adhesive, very hard or elastic. The result is a tough, tight and invisible bond. One of the key benefits of UV Bonding is the transparency of the adhesive. Once the adhesive has been set using UV light it is practically invisible, creating a virtually seamless joint. The finish that UV Bonding offers makes it the ideal choice for projects such as glass furniture, showcases and shower screens, where screws, hinges and any other mechanical fixings are undesired, keeping any visual obstruction to a minimum, free from screws, drill-holes, residue, mess or anything else you’d normally associate with trying to attach fixtures and fittings to glass. Curved Glass It offers today’s designers the opportunity to create some distinctive, desirable and eye-catching furniture. We have produced dining tables, coffee tables, boardroom tables, reception desks, cabinets and curved glass shelving with curved glass. These are produced in annealed, toughened and laminated forms to the highest standards and with exceptional quality. Find the exact design you are looking for, we build it all. Whatever you’re after in terms of practicality and looks, we supply and install it. We work with a variety of glass styles so that you can enjoy a quality, bespoke product for your home or business. All our experts take pride in our ability to craft and build you a unique product. We believe the simplest of items say a lot about yourself, or company. Whether you’re looking for glass balcony or shower screen, we do it all. Customers’ requirements have top priority for us, so we find tailor-made solutions for private and business customers at very reasonable prices. Our specialists can assist with more creative requests, providing just the right solution for all your glass requirements. We provide comprehensive and highly qualified consultations, from the choice of the type of glass to the processing and finishing in order to meet your needs.